XRF spectrometer with IntelliPower technology allows analysis of up to 84 elements (form Oxygen to Uranium) of the periodic table in conductive or non-conductive solids or liquids within the range from ppm levels to 100%. Fluorolog 3 is a unique, modular system for the measurement of steady-state fluorescence and phosphorescence spectra of liquid and solid samples including non-transparent materials. The spectrophotometer is very sensitive and flexible to be used for various types of fluorescence or phosphorescence measurements in emission, excitation and synchronous modes. The set is able to measure in ultraviolet, visible and near-infrared regions. Diffuse Reflectance and Near-IR UpDRIFT accessory and environmental chamber allowing experiments under controlled temperature (up to 900 °C) and/or under controlled gaseous atmosphere. determined for measurement of the infrared spectra of the agresive samples such as fluoride melts. 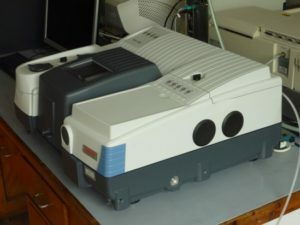 Unique configuration equipped with high power Ar laser (output at the spectral line 514 nm higher than 2 W) and HeNe laser, and with other specific supplements such as FT IR, high temperature stages, and software (spectral libraries, mathematical-statistic software Solo-Mia, etc.) is used for recording and evaluation of the Raman spectra of all types of materials, including glasses, ceramics, corrosion products, etc. Double-beam spectrophotometer is characteristic with a high spectral accuracy and adjustable spectral bandwidth. Spectrophotometer Cary 100 is ideal for measuring an extensive set of samples from solutions to solid/non-liquid optical materials. 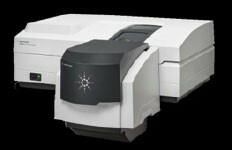 It can be used for various scientific, as well as applied industrial applications, based on measuring the spectra in the whole UV-VIS range (200-900 nm), quantitative analysis of chromophores (including biochemical compounds), measuring the reaction kinetics, etc. Cary 100 spectrophotometer is used mainly for studying the interactions of organic compounds with clay minerals for investigations of the optical properties of dye cations in clay dispersion, adsorption of organic pollutants on the surface of organically-modified clay adsorbents, determination of the reaction products in clay-catalysed organic reactions, etc. Measure 175 to 3300 nm using a PbSmart NIR detector for extended photometric range. Measure beyond 8.0 absorbance units with reference beam attenuationVariable slit widths (down to 0.01 nm) for optimum control over data resolution. Cary Universal Measurement Accessory (UMA) Enabling multi-angle, absolute reflection (R), transmission (T), absorptance (A) and scattering measurements of solid samples. 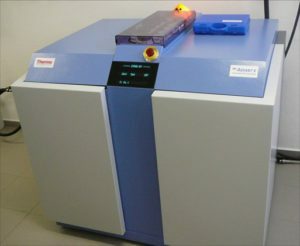 The atomic absorption spectrometer with the graphite furnace atomizer for determination of trace concentrations of the metal elements. The liquid samples of the micro-litre volumes are atomized in the graphite furnace atomizer. Zeeman technique is applied to correct high values of nonspecific absorption. 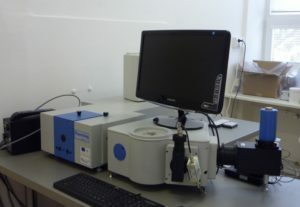 Inductively coupled plasma optical emission spectrometry (ICP-OES), is an analytical technique used for the detection of metals. It is a type of emission spectroscopy that uses the inductively coupled plasma to produce excited atoms and ions that emit electromagnetic radiation at wavelengths characteristic for a particular element.